Earlier this month, 54-year-old John Stoll Jr. of Pennsylvania helped both the Wellsville Fire Department and the Department of Conservation and Natural Resources in the rescue of a deer that fell through the ice near Gifford Pinchot Park. According to the York Daily Record, Stoll offered to take the animal home and nurse it back to health. 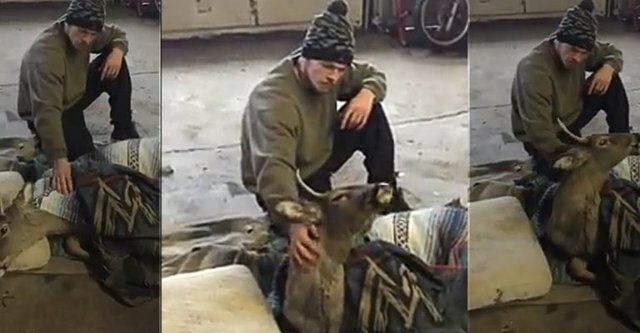 He informed authorities of his intention to take the animal home and care for it, put the deer in the back of his truck and drove it to his home. Stoll later shared a video of the deer on Facebook, which can be viewed below, with the caption “Saved four buck from Pinchot Park today brought this guy home to save him.” Sadly, the deer didn’t make it and passed away the following morning. Stoll then decided to give the animal a burial. Stoll contends that someone from the local Game Commission was on the scene that day and no one there appeared to have a problem with his taking the deer home. In fact, it didn’t become a problem until his video went viral. “If they didn’t want me to take that deer, why didn’t they didn’t they come to my house right as soon as I got home?” Stoll said. “Nobody said I couldn’t take it,” he added. Wildlife Resource Officer Tim Wenrich, a representative from the Game Commission, said that Stoll should have left the animal there until they were able to euthanize it. The Game Commission had no intention of attempting to save the animal. “I would have definitely preferred that the deer been left in [its initial] place,” Wenrich said. Stoll said an online fundraiser was established to help him pay the fines and he also plans to donate part of the proceeds to an organization that helps animals. “I will never do nothing for the Game Commission ever again,” Stoll said. Perfect example of adding insult to injury! Delivered to you by the state.